Who doesn’t like Potato Corner? It’s a once-in-a-while indulgence that makes you happy on really long and busy days. It’s pretty much the comfort fries of choice for a lot of people, which is why it has transformed into the successful franchise business it is now. So why not take a calculated risk and invest in a small part of the pie? 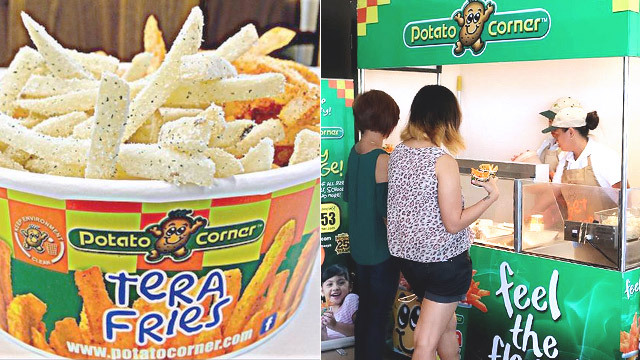 Potato Corner has been around for more than two decades, and has been one of the strongest and the most reliable cart and kiosk enterprises around. While their fees per package are pretty competitive, their application process is more rigorous than most. What franchise packages does Potato Corner offer? The School Cart Package should be, first and foremost, located in a school. This is their cheapest package, which calls for a total investment of P257,600*. This is inclusive of 12 percent VAT, a franchise fee of P100,000 (valid for three years), your initial supplies worth P2,000, your cart (2.1m x 1.2m x 0.865m), your wares and equipment which will include your fryer and freezer, two uniform sets for your personnel, and other tools to support your cart. The renewal fee for this package is P50,000 for another three years. The Standard Cart Package are for locations other than campuses, and is a bit more expensive than the school cart. The total investment for it is P431,200*, which is inclusive of 12 percent VAT, a franchise fee of P150,000 (valid for five years), your initial supplies worth P5,000, your cart (2.4m x 1.2m x 0.865m), your wares and equipment which will include your fryer and freezer, two uniform sets for your personnel, and other tools to support your cart. The renewal fee is P75,000, and is good for another five years. Potato Corner's largest package, this provides customers space to sit and dine within the store. Once you've figured out how to go about these, you can begin the application process. For the brand, it’s not only important that you have the budget to invest in a franchise; it’s also a must to have a sustainable marketing plan to ensure that your business will grow and flourish. - a location offer sheet. Aside from describing and submitting photos of your proposed location, you’ll need to give actual foot traffic numbers from 9:00 a.m. to 9:00 p.m. This will take a lot of work, but you'll have to be patient with it especially since you’ll need to provide a projection of how many customers will come up your cart daily. TIP: It’s good to note that your cart should be at least 500 meters away from another Potato Corner store. Who are your customers and where are they coming from? Are they employees from a nearby office? Or maybe train passengers who are up for a quick snack? These questions will help you get a handle of who exactly you’re selling to, which can help you forecast your income. You’ll also need to submit a list of competitors that are located within your vicinity, including their distance from your cart, what they sell, their price range, and your estimate of how much they’re making in a day. Not only will it give Potato Corner an idea of how to better support you, but it will also help you run your cart smartly by catering to the right people. It’s best to have two personnel for your cart's opening and closing shifts. Potato Corner will cover their training, but you’ll need to set aside budget for their regular salary. Potato Corner’s training goes for six days, the first of which will give them the basics of the brand and the SOPs of how to cook the fries and how to keep the cart running. The next four days are in-store immersions that will give them an overview of happens on a day-to-day basis. The sixth day is for their exams, which will be given in Potato Corner’s office. When do you have to pay your fees? Once you’ve completed and submitted all your requirements, Potato Corner will schedule a site visit to see if your location meets their standards. What follows is a grant meeting, then a contract signing—this is where you’ll need to pay your fees. Upon settlement, the company will start the construction of your cart, so you may have to wait for a few more weeks. When the cart is ready and your crew has been trained, you can finally open your Potato Corner cart for business. How much can you earn from investing in a Potato Corner franchise? Based on Potato Corner's projections, if your sales amount to P5,500 a day, which totals to gross sales of P165,000 in 30 days, you can earn at least P32,576** net every month after you subtract your food, electricity, rent, labor costs, and other expenses. Of course, these are only projections and may change at any given time, but at least you have a ballpark figure to help you check if your business is doing okay. You can also try joining forums (like Girltalk) to get insights from fellow business owners. If you think you’re ready to jump into a Potato Corner franchise, it’s best if you first attend one of their free introductory seminars that happen every Friday at 2 p.m. in their Luzon office. If you’re from Visayas or Mindanao, no worries—they also have offices set up in your location where you can inquire. For other queries, email iwantfranchise@potatocorner.com. *All rates listed in this article may change without prior notice. **These are strictly projections and should only be used as a guide. Values may vary based on real-world factors.